Think cocoa is for winter only? Think again! Sure, it’s most appealing to face into a steamy cup when it’s frosty outside. But a rich, deep cocoa drink is so satisfying year round. And while in Arizona now I do tend to switch from cocoa to smoothies by late spring, when I lived in Seattle a hot cup of cocoa was pretty much welcome year round! As a “joyful nourishment instigator” (integrative health coach, fitness trainer, fitness nutrition specialist, herbalist and motivation specialist), one of my specialties is inspiring people to LOVE fueling their healthiest best bodies. Embracing chocolate plays a tasty role in that joy! 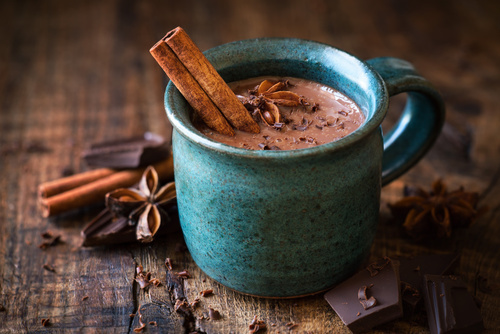 Like many wellness experts, I consider cacao a healing food as well as a pleasure source, and there’s ample evidence to support that this beloved treat is a well-rounded nourisher. Of course, chocolate candy is not a healthy food; too many people confuse “cacao” with the highly-processed, hyper-sweetened mainstream supermarket bars that bear little resemblance to their cacao origins. Most studies on chocolate’s benefits are conducted with unsweetened, minimally processed cacao. But dark chocolate is actually included in the Healing Foods Pyramid™ as part of a balanced whole foods/plant-based diet. Quality dark chocolate is rich in fiber, iron, magnesium, copper, manganese and other minerals. It’s also loaded with biologically active organic antioxidant compounds such as flavonoids (a class of polyphenols including flavanols, procyanidin and catechins), among others. It has more antioxidants than many fruits and vegetables—more phenolic antioxidants than most foods, in fact. There is scientific evidence that cacao can improve heart health (yes, really! ), increase blood flow, lower blood pressure, [yup! ], improve brain/neuro function (including in dementia) and cognitive performance, protect skin, lower inflammation, reduce stress hormones, boost immunity, and more. For cocoa/cacao beverages, you can use either raw minimally processed cacao powder or cocoa powder that’s dutch-processed with alkali (and generally milder in flavor). Either type of powder has less fat than bar chocolate and is probably the healthiest way to consume cacao (though I do love my 80-90% bars!). Cacao powder is much higher on the ORAC (oxygen radical absorbance capacity, representing antioxidant capacity) scale than cocoa powder. But even cocoa powder has value. For the most healthful chocolate beverages, unsweetened is the way to go (you can sweeten lightly as needed). I prefer raw cacao, but will occasionally use cocoa (as long as it is pure cocoa without milk or sugar or processed additives—no mixes!). I’m a cacao aficionado, so I love to try every organic and fair-trade cacao powder I can find. Some of my favorites right now are Viva Naturals, Navitas Naturals, Healthworks, Zint, and Earth Circle Organics. The cacao varietal/origin you choose will give you a different flavor and even a different texture. NOTE: The quantities of nutrient/herbal boosters don’t need to be super exact; these are just good starting points. ¼ tsp, ½ tsp, 1 teaspoon….whatever! More will give you more benefits, but may change the flavor in ways that take a bit of getting used to. Work up slowly. But I do encourage experimentation! Your ratio of hot water to hot “milk” may also vary and I suggest trying organic unsweetened almond, cashew, pecan, walnut, macadamia or coconut milk (I tend to use almond or macadamia myself—a blend of the two is creamy!). For each recipe, my preferred method is to make a rich paste or smooth thick liquid out of the powders with a little hot water, then add your hot nut milk of choice to that and stir. Add any other liquid ingredients (if any) and enjoy! · Add enough very hot water to make a paste or a thick liquid. · Add ½ to 2/3 cup hot nut/plant-based milk of your choice. Find one that appeals to you for its flavors or specific benefits, and give it a sip! ROBYN LANDIS is an ACE-certified holistic health coach, fitness trainer, fitness nutrition specialist, behavior change specialist, bestselling author and herbalist who likes to call herself a “joyful nourishment instigator.” A 25-year veteran of the fitness industry who vibrantly walks her talk, she believes that we can evolve how we think about healthy living to make it a natural, joyful choice. She has helped thousands overcome health-info overwhelm, and crack the code of “motivation.” She weaves nearly three decades of study and practice into a signature blend of science, spirit, and common sense—refreshingly free of hype, regimens, and extremes. Robyn’s books (including Herbal Defense, cowritten with one of the world’s top plant-medicine experts) are published in five languages with a combined 200,000 copies in print, and her third is on the way. She coaches and trains privately and in groups, helping people love getting the body and energy that’s fit for their purpose, and grow “chronologically richer” fearlessly and beautifully. Her clients learn to integrate food, exercise, rest, meditation and traditional healing, and become deeply happy getting exceptionally healthy™ —with energy to spare and the health to thrive and live fully. She also speaks and writes passionately about how we can transform medicine and fitness culture to inspire people to be good to themselves—which is what self-care really is.